This a guest post by Mustafa Uysal (m_uysl). He is from Turkey and works as a full-stack developer at NefisYemekTarifleri.com. 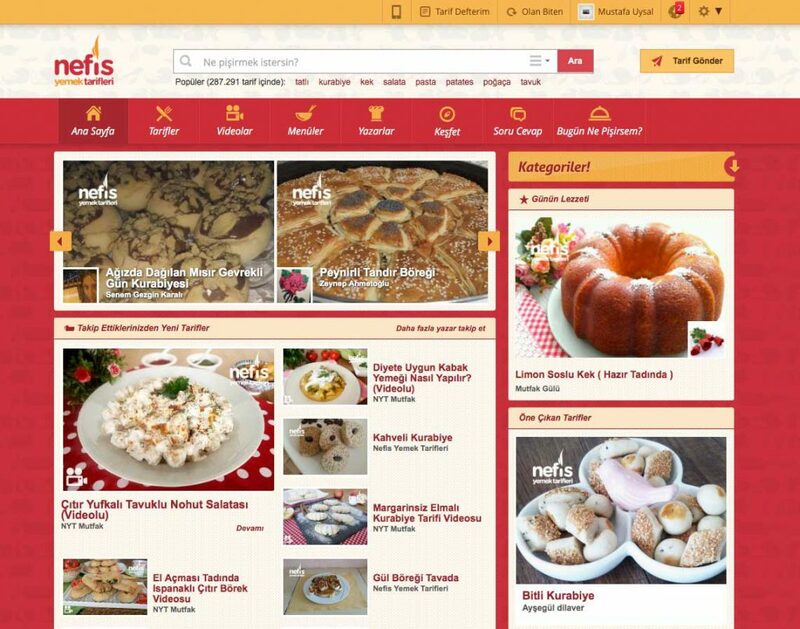 NefisYemekTarifleri.com is the largest Turkish recipe sharing platform in the world. It has more than 290,000 recipes that reach millions of users every single day. NefisYemekTarifleri is a unique platform that uses WordPress and BuddyPress for all its applications — desktop, mobile web, Android, iOS, and AndroidTV. We use ElasticPress to handle 10M+ requests. To scale this platform, we use various tools which we share at Stackshare. We share some of our stats on Twitter #nytstats. Our platform is community-driven, i.e., all the recipes come from our users. The membership and number of recipes submitted have increased dramatically since we started using BuddyPress. The users feel more welcome because they have their “own space” where they can easily add their avatars, cover images, post their recipes, and share other social media links. BuddyPress has enabled users to engage more with other registered members as well as invite new users to the site. Our editorial team spends a majority of their time editing user recipe submissions. Currently, we are using all BuddyPress core components except Friends and Groups. Thankfully, r-a-y‘s BuddyPress Followers plugin is a great replacement to the built-in Friends component. Our notification system is quite different from the standard BuddyPress notifications. It supports push and web push notifications and works async over the message queue. There are a lot of activities which can trigger notifications. There were and are many instances when we send notifications to tens of thousands users every day. For example, when one author with thousands of “followers” publishes a new recipe, it took a long time to send a simple notification like, “Hi there! Jane Doe published a new recipe, take a look!” Consider when we have 10 authors with many followers publishing new recipes at the same time. In the early days, we created a custom `nyt_bp_add_notification` script which called BuddyPress’ own notification that added a function for bulk messaging. We found out that it was causing lags on our slave MySQL servers because the impact on the disk IO was dramatic. 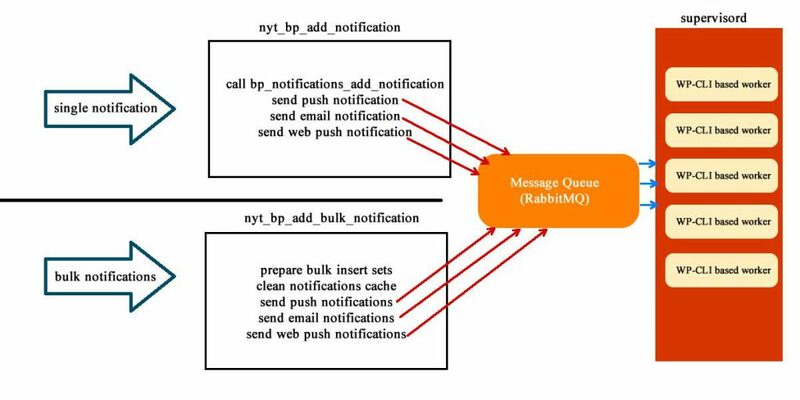 Our solution was a new custom script, `nyt_bp_add_bulk_notification`, which inserts data directly to database (as a bulk SQL query). By the way, we highly recommend Percona’s PMM for catching performance hogs. At the end of 2016, we migrated from parse.com to our self hosted parse for push notifications. After which, we used web-push-php for the web push notifications. We decided to replace the built-in cover image feature and create our own Facebook-inspired UI which was more user-friendly. The feedback has been quite positive from our members. A user can directly upload a cover image by clicking on an icon on top of the cover image area. The full-size image is saved behind the scenes. Quick image resizing after the image upload has completed. A user can change image position via drag-drop. The full path and image coordinates are recorded as meta. All messages have to be between two people, we canceled group messaging. When someone you are not following sends a message, that message is marked as “pending”. You also “block” that person. Fluent messaging: all conversations between two people use the same thread. Messaging, reimagined: We made some necessary changes a bit in a hacky way on the messaging component. Changing messaging behavior was not easy and there are some edge cases we have to monitor and address. Limit notifications: Only allow 200 notifications per user, WordPress’ cron cleans up on a daily basis. API Endpoints: We had to be careful on managing API endpoints, addressing the mobile apps a bit differently than web, especially when you do caching inside the device. Long-running process: MQ workers are long-running PHP scripts and they caused memory problems on production after a while. We fixed this issue with stop_the_insanity. User suggestion to follow a member. Activity improvements (currently, just acting like feed). BuddyPress allows us to build one of the largest niche communities in the world. Fortunately for everyone, BuddyPress is being maintained by developers who are active contributors to WordPress core. Our thanks to all BuddyPress contributors, especially the BP core team. Mustafa Uysal of NefisYemekTarifleri.com also runs his own company, SKOP. He’s a plugin developer who enjoys solving tough problems and making things faster and scalable. He’s also a workaholic and was interested in archery once upon a time. 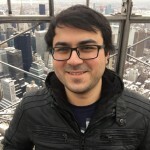 Mustafa is one of the WordPress Translation Editors for the Turkish language. It looks like notifications is a major part of your website. I agree that our notifications code can be tweaked for better performance, particularly limiting and purging notifications. Currently, every time a notification is read, it stays in the database forever, which doesn’t make any sense since most people will never visit the “Read” notifications tab again. We will definitely look at your patch for optimizing fetching notifications. Push notifications sounds awesome. We probably cannot add push notifications to core since it’s better to rely on an external provider to do push notifications, or unless you have the server resources to run your own service worker (like you are!). Your custom cover image UI looks great and your bulk notifications function, nyt_bp_add_bulk_notification(), sounds interesting. If there is anything that can be abstracted and sent as a patch to core, that would be awesome! Great to hear about your use of BuddyPress on your site! Thanks for the detailed post full of interesting items and good advice. And chance of your releasing the Cover Image feature? As patch or plugin? Unfortunately, It’s not possible to release as a patch or plugin for now because it’s deeply integrated to our template and back-end stuff.